A majestic fort built in 1458 AD set amidst massive vallum and surrounded by hundreds of temples, the creation of one of Mewar’s legendary heroes Rana Kumbha and the birthplace of tAhe legendary combatant Rana Pratap, Kumbhalgarh is the site of The Great Wall of India. This 36 km fort wall is avowed to be the second longest wall in the world after the Great Wall of China. Encircled by thirteen elevated mountain peaks, the fort is constructed on the top most ridges around 1,914 meters above sea level. The fortifications of the fort extend to the length of 36 kilometers and this fact has made this fort to be in the international records. It is stated to be the second longest wall in the world, the first being ”the Great Wall of China”. The huge complex of the Fort has numerous palaces, temples and gardens making it more magnificent. Kumbhalgarh is a fantastic, remote fort, fulfilling romantic expectations and vividly summoning up the chivalrous, warlike Rajput era. This unconquerable fortress is secured under the kind protection of the Aravali ranges. The huge complex of the Fort has numerous palaces, temples and gardens making it more magnificent. Under the rule of the king Rana Kumbha of Mewar, his kingdom stretched right from Ranthambore to Gwalior. Out of the 84 fortresses that defended Mewar from its enemies, about 32 were designed by Rana Kumbha himself. Among all the fortresses designed by Rana Kumbha , Kumbhalgarh has been the most impressive, famous and the massive one with a wall of the length of 36km. It was built in the 15th century and is one of the very few forts in history, that was never conquered. It separated Mewar and Marwar from each other and was also used as the refuge for the rulers of Mewar at the times of danger. According to legend it was here that the young Maharana Udai Singh II was brought for safety by his nurse Panna Dhai after an assassination attempt. 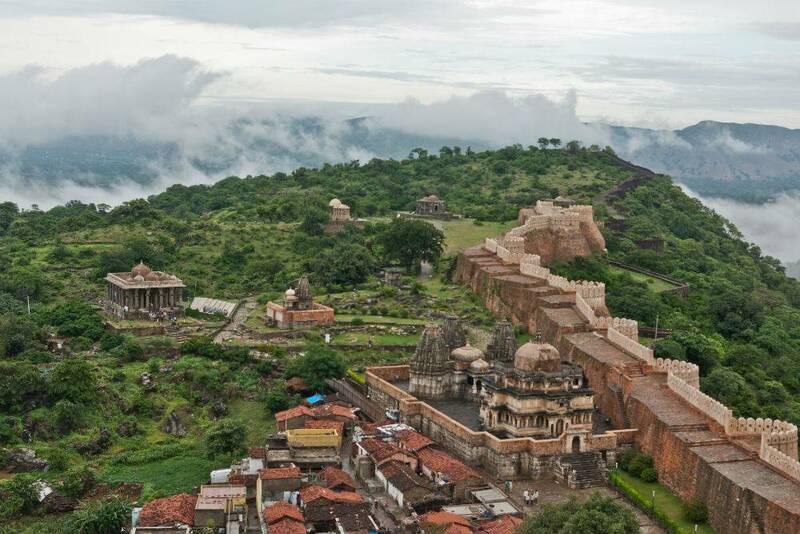 Kumbhalgarh was also the birthplace of Udai Singh II’s famous warrior son Maharana Pratap. The fort remained impregnable to direct assault, and fell only once, due to a shortage of drinking water, to the combined forces of Mughal Emperor Akbar, Raja Man Singh of Amber, Raja Udai Singh of Marwar, and the Mirzas in Gujarat. Second Longest wall in the World !!! Kumbhalgarh Fort is the second most important fort of Rajasthan after Chittorgarh and is situated about 84 km from Udaipur. Kumbhalgarh is famous for its historic monument – the majestic Kumbhalgarh Fort and captivating wildlife sanctuary. The impregnable Fort boasts of seven massive gates, seven ramparts folded with one another with designed walls toughened by curved bastions and huge watch towers. The Fort is also known for its famous palace that resides on the top of the structure, known as ‘Badal Mahal’ or the Palace of Cloud, that encloses beautiful rooms with pleasant colour schemes of green, turquoise and white, which provides a fascinating contrast to the raw, earthy and grim fortress. The palace was rebuilt by Rana Fateh Singh in the late 19th century. It’s worth taking a leisurely walk in the large compound, which has some interesting ruins and temples and is usually very peaceful. Kumbhalgarh castle is a Mewar fortress at the westerly range of Aravalli Hills, in the Rajsamand District of Rajasthan country in western India. it is a global history web site included in Hill Forts of Rajasthan. constructed during the path of the fifteenth century by using Rana Kumbha and enlarged via the 19th century, Kumbhalgarh is also the birthplace of Maharana Pratap, the outstanding king and warrior of Mewar. Occupied till the past due 19th century, the citadel is now open to the general public and is spectacularly lit for a couple of minutes every evening. Kumbalgarh is situated 82 km northwest of Udaipur by street. it’s far the most vital fort in Mewar afterChittaurgarh. In 2013, at the 37th session of the arena historical past Committee held in Phnom Penh, Cambodia, Kumbhalgarh fortress, along with 5 different forts of Rajasthan, was declared a UNESCO international historical past site below the institution Hill Forts of Rajasthan. The fort is the second largest wall in the world after the wonderful Wall of China and the second biggest fort in Rajasthan afterChittorgarh castle. Rajastan, India’s one of the most colorful states is replete with lots of mystifying, mindboggling and fascinating palatial palaces and huge forts that take us right back to their glorious and vibrant past. Rulers of north and north west India always lived in constant fear of invasions from nearby rulers as we as foreign rulers from NW frontier regions. So, they felt compelled to build huge strong self- contained forts with all facilities to stay alive in case ofprolonged sieges. Hence, these regions have numerous forts unlike southern india where the threats from other rulers were minimum. Cradled in the Aravalli range, Kumbalgarh Fort is the second longest wall in the world. Local guides describe it as the second longest, continuous wall in the world after the Great Wall of China. It’s also a UNESCO World Heritage site that circumscribes hundreds of ancient temples, palaces, and endangered wildlife within its ramparts. In spite of these superlatives, the impressive bastions of the Kumbhalgarh Fort border on obscurity in tourism-saturated Rajasthan. 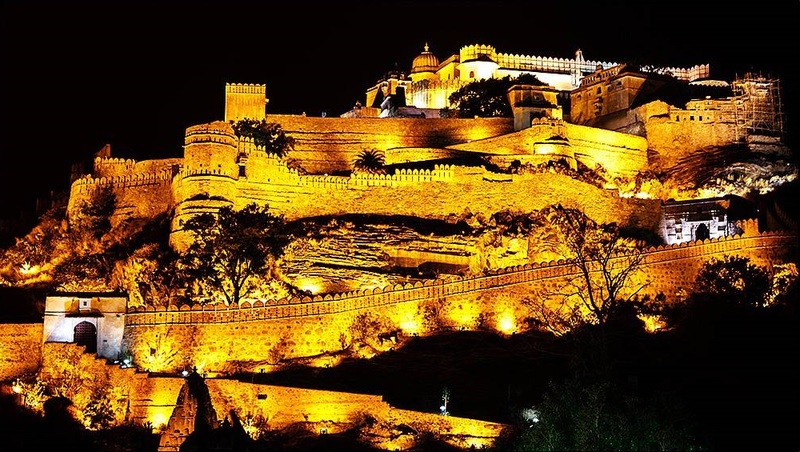 Eighty kilometres north of Udaipur, cresting the peaks of the Aravallis, this fort is one of 32 built in the fifteenth century by Maharana Kumbha, the Rajput ruler of the Mewar kingdom. If the fortress can inspire awe even in these jaded times, it must have been a really formidable sight for a medieval traveller. After traversing a landscape punctuated by wild forests and lakes, it suddenly materialises, crowning the summit of a hill. It is the highest elevation in Rajasthan, after Mount Abu, with a thick wall encircling it like a python. It’s evident that the Maharana’s aesthetic sensibility favoured unabashedly big, bold, and beautiful structures. Ram Pol, the fort’s main gateway towers overhead, the palaces are perched at lofty heights, and even the footrests of the Indian-style toilets inside are so wide apart that a grown man would have to strain to squat comfortably. But nowhere is his personal style more flamboyantly displayed than the crenellated ramparts that weave whimsically through remote Aravalli forests for an astonishing 36 kilometres. They wind around the rim of the hilltop enclosing a large expanse of wooded hillside. Outside this perimeter, plunging down the hill into the deep valley below, are the dense jungles of Kumbhalgarh Wildlife Sanctuary, where wolves, leopards, and panthers reign.